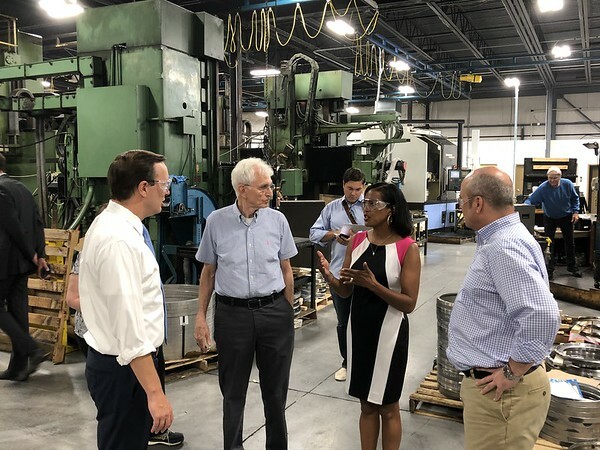 NEW BRITAIN - Just a few days after winning her party’s endorsement for Connecticut’s 5th Congressional District, Democrat Jahana Hayes was back on the campaign trail Friday talking to manufacturers in the city. 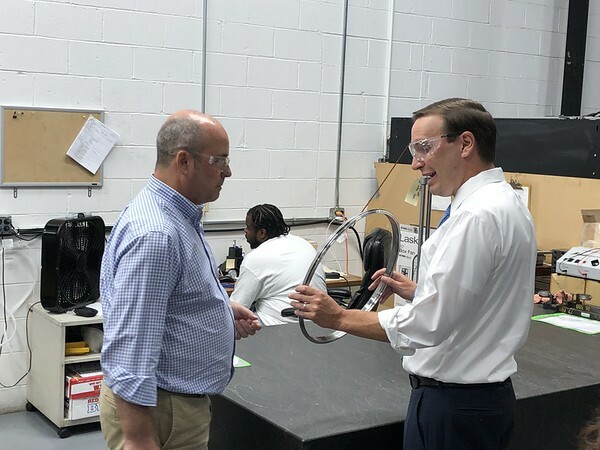 Hayes and U.S. Sen. Chris Murphy, D-Connecticut, the man who encouraged the 2016 National Teacher of the Year to run for Congress, visited A-1 Machining Company Friday to tour the facility and hear what concerns face the industry. “Our biggest need is skilled people,” said Mark Lloyd, president of Crescent Aerospace Technology, LLC, the parent company of A-1. A-1 Machining was established on a “shop-assist” program, meaning the company helps bigger manufacturers with larger projects. Essentially, the company takes materials and parts from forging companies, semi-finishes them, then sends the parts off to another company for the final finish. Lloyd said the company has been focused on reaching out to youths in the area who are interested in working in manufacturing. The company is expanding into a new building next door, but still needs workers to fill jobs. “Aerospace in general is booming, and there are customers that we’ve not even approached yet,” Lloyd said. Hayes talked about the need to expand post-high school options for students. The congressional hopeful talked about the different opportunities students have at technical high schools. Hayes said schools should do more to introduce students to a variety of career pathways at a younger age. Steve Davis, a manufacturer at A-1 Machining for 36 years, said the main job requirements are simply a desire and willingness to learn and do what the company does. The company also has to compete with other manufacturers, like Pratt & Whitney, for a declining workforce. 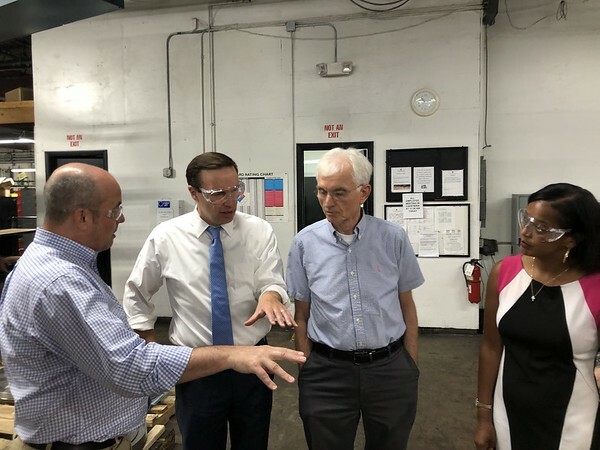 While happy that the company is expanding, Murphy said its main need is clear - more skilled workers. “This company will only succeed if they have more people coming in the door,” Murphy said. Posted in New Britain Herald, , Business, General News on Wednesday, 22 August 2018 10:30. Updated: Wednesday, 22 August 2018 10:32.